Market Tools, a software and service provider for management and research conducted a survey of 331 companies with an annual revenue of more than $10 million annually. Of those organizations, 23 percent rely on social networks to support their customer service and to provide feedback. Topping the list with 48 percent was Facebook, 17 percent used Twitter, and another 17 percent relied on company blogs. Almost every organization from animal shelters to zoos has to be aware of public opinion. With 500 million active Facebook users, logos and pictures and carefully thought out postings create and maintain serious platforms businesses depend on in the social media world. Facebook can spot out the latest trends, behaviors, and what the most influential customers are buying. So how can a business use social media such as Facebook effectively? To begin, the efficient use of Facebook is not a hit or miss exercise. An organization will want to think carefully about who will handle this – from getting the company profile created, the gathering of data, posting, creating content, and even approval of content. Social media responsibilities can be a full-time job, and an intimate knowledge of the company and its brand and culture have to be serious contemplations when deciding who will be in charge of the day-to-day maintenance of either Facebook or Twitter – or both! 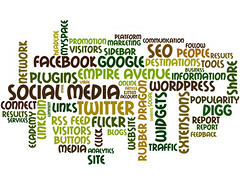 Remember where word of mouth has always influenced your friends, family, and co-workers, it’s not unusual for “friends” meeting up with new “friends” on Facebook and having hundreds and hundreds of consumers and potential new customers visiting your “page.” Fast and friendly personal responses can be very influential. If a business has a social conscience which reflects a particular responsibility, perhaps a local or national charity, social media can launch a company’s approval index substantially. Customers with complaints, for instance expect a fast response; if not there is likely to be more complaints thus creating a poor company perception. On the other side of the spectrum, however compliments from happy customers do a lot for a company. It’s almost as good as sitting at the local pub praising an organization personally. But no successful Facebook campaign is random. It must be carefully orchestrated so an organization can present itself with a superior product, a welcoming personal message, well thought-out posts, timely responses, and a carefully educated and trained staff whose job it is to deliver great service and do it with pride. I’ve seen this go wrong many times. I once “liked” the Facebook page of a very well known technology company, and was astounded at how dumb the content was. You’re exactly right, the content needs to be well though out and concise. Great insights on using Facebook to promote your company. I also agree that it is a big decision on who you choose to be in control of your social media. I couldn’t agree more. Social media is a very important part of customer service in this day and age and it is critical to do what we can to get the word out there on what companies have to offer. Some day, more companies will pick up on this and will see the advantages that this type of media really has for them.